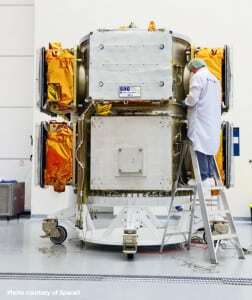 [Via Satellite 07-18-2014] Sierra Nevada Corporation (SNC), prime contractor for Orbcomm’s OG2 satellites, has established communication with the first six spacecraft launched July 14, 2014. The company is working with Orbcomm to complete the early on-orbit checkout. SNC confirmed the deployment of all solar arrays and antennas as well as connectivity with Orbcomm’s gateway Earth station network. The next tasks are verification of the full system performance for Subscriber Terminal communications and evaluating Automatic Identification System (AIS) capability. Orbcomm expects the satellites to enter commercial service approximately 60 days following the launch. The OG2 constellation is based on SNC’s SN-100 satellite bus. A total of 11 more OG2 satellites are in final integration, on schedule to launch before the end of fourth quarter 2014. SpaceX is contracted to launch the next batch of OG2 satellites.